Thank you St. Therese for sending me a rose today! While at Bible Study I commented on a bracelet my friend was wearing. Suddenly she took a different one off and said “do you want this?” It is a heart with a single rose on the inside! She said “I don’t know why I took that one off!” Thank you, thank you, thank you St. Therese! Help me to practice your little way – we share the same birthday! 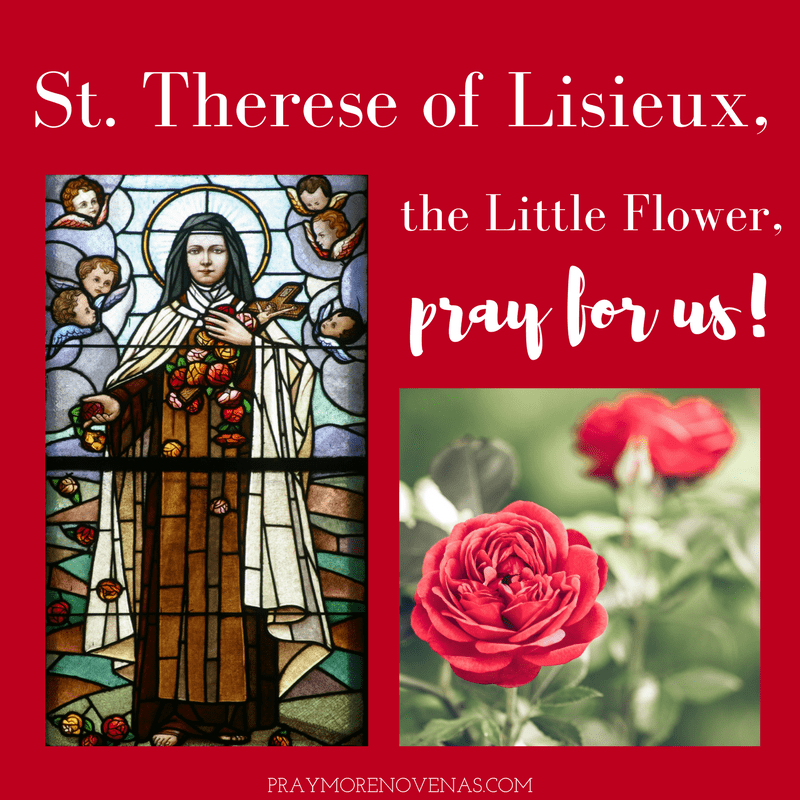 Dear St. Therese, I want to thank you for your intercession. Please pray for my mother and that God gives her the strength she needs now. Also, please continue to pray that God will heal me from what I have been struggling with for quite some time. St. Therese I pray that you please intercede for us to find an affordable home that works for both of us. I pray that I’m able to pay rent on time. I pray that friends will have a healthy baby and husband will be safe. I pray that S will find the right job/career that God has for him. I pray that you bless our friendship, love, growth, present and future. In Jesus name, Amen! St.Therese pray my nephew and his new wife will return to the Catholic/Church/Faith. Pray for Gee surround with love and peace. Blessed St Theresa please bring a good outcome for David and help his family overcome this illness. Please help me to become mentally stronger and be able to sort my medication better. Thank you that Keith seems better and that l am perhaps learning to cope. In the name of the father.Amen. I prayed for intercession of St. Therese in healing my terminal cancer. My CT Scan this past week shows a miraculous shrinkage of the tumor by 70%. This is giving me more time here on earth with my husband and 2 boys, family and friends. I continue to pray with St. Therese for God’s will be done. Help me to trust You more that my actions & words may b a reflection of You; so that others may see & trust You through me.